Why do corals in the Gulf of Aqaba (Red Sea) do not bleach in spite of warming but sometimes die due to massive algal blooms? Can be the Mediterranean Sea a new coral reef area? Insights from tracking climate change effects in a warm-temperate sea. Regeneration and reproduction expertise of Tubastraea genus: an assay to establish T. coccinea as a model organism. Great Barrier Reef Outlook Report 2019: What is it and who reads it? What do you know that we should know? Rapid transgenerational adaptation of a reef fish to climate change / Why are there so many endemic species in the Red Sea? So you want to conserve biodiversity? This week Amelia Wenger shows us how to make difficult conservation decisions! CoTS outbreaks: How they start, how they spread, and how can we stop them? Learning to ‘Shoot in the Dark’: The promise, potential and pitfalls of impact evaluation in the conservation sector. Does government effort align well with fishers’ intention? 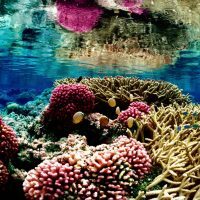 Protecting the unknown: what data for local coral reef conservation planning? What good(s) are ecosystem services? How do scientists’ perceive their role at the ocean science-policy interface? Immunity and secondary metabolite production in the soft coral Lobophytum pauciflorum in competition and the effects of ocean acidification on these processes. Natalia Andrade Rodriguez, ARC CoE for Coral Reef Studies. Michael Bode, School of Botany, University of Melbourne. Dr. Michael Fabinyi, ARC Centre of Excellence for Coral Reef Studies, James Cook University, Townsville. Habitat fragmentation: How does it affect coral reef fish biodiversity? Spatial planning in the Dutch North Sea: MPAs, wind farms and the effects on the ecosystem. Virginia Chadwick Memorial Reef Talk – Fish on Acid: Will Ocean Acidification Drive Fish Crazy? Professor Philip Munday, ARC Future Fellow in the ARC Centre of Excellence for Coral Reef Studies at James Cook University. What do Australians think about the Great Barrier Reef and why does it matter? Richard Hamilton, The Nature Conservancy. Scott Ling, Marine & Antarctic Futures, Institute for Marine & Antarctic Studies, University of Tasmania, Hobart. Professor Terry Hughes, ARC Centre of Excellence for Coral Reef Studies, James Cook University, Townsville. Philippa Cohen, ARC Centre of Excellence for Coral Reef Studies, James Cook University. DIVERSITY: How did ecology get it so wrong and what’s the solution? Double seminar: Coral reef research goes viral: determining the role of viruses in coral reefs. Dr Karen Weynberg and Dr Elisha Wood-Charlson – Australian Institute of Marine Science. Dynamics of seawater carbonate chemistry, production, and calcification of a coral reef flat, Central Great Barrier Reef. Andrew Chin, Centre for Sustainable Tropical Fisheries and Aquaculture, James Cook University. Dominique McCowan, James Cook University. Dr. Louisa Evans, ARC Centre of Excellence for Coral Reef Studies, James Cook University. Jean-Baptiste Raina, AIMS/James Cook University, Townsville. Dr Laurence McCook, Director of Climate Change and Science at the Great Barrier Reef Marine Park Authority. James Tan, ARC Centre of Excellence for Coral Reef Studies, James Cook University. Melanie Trapon, ARC Centre of Excellence for Coral Reef Studies, James Cook University. Connectivity of reef fish populations – what happens between hatching and settlement? Caribbean corals aren’t recruiting: A mismatch between larvae and settlement cues? Sarah Davies, PhD Candidate at The University of Texas at Austin. Is ocean acidification a threat to marine fishes? Molecular and physiological studies of inorganic carbon utilization in the Scleractinian coral Stylophora pistillata (Esper, 1797). The role of social and ecological networks in natural resource governance: What relational patterns make a difference? Does dimethyl sulphide (DMS) protect dinoflagellate symbionts (Symbiodinium sp.) from oxidative stress? Public lecture: Fish in hot water- How will climate change affect coral reef fishes? Coastal/Marine SDI – now more important than ever! Indigenous cultural heritage and systematic conservation planning: a symbiosis? Glowing pigments of reef corals as indicators of environmental stress? Habitat vulnerability in conservation planning. When does it matter and how much? The mismeasure of conservation: how much difference do we really make? Millennial-scale episodes of reef accretion and degradation determined by U-series dating of coral death assemblages in Moreton Bay, SE Queensland, Australia.